Got a Nasty Note from your Neighbor? Ever left—or received—a nasty note from your neighbor? Well now you can showcase your talent for leaving (or getting) creatively malicious notes. 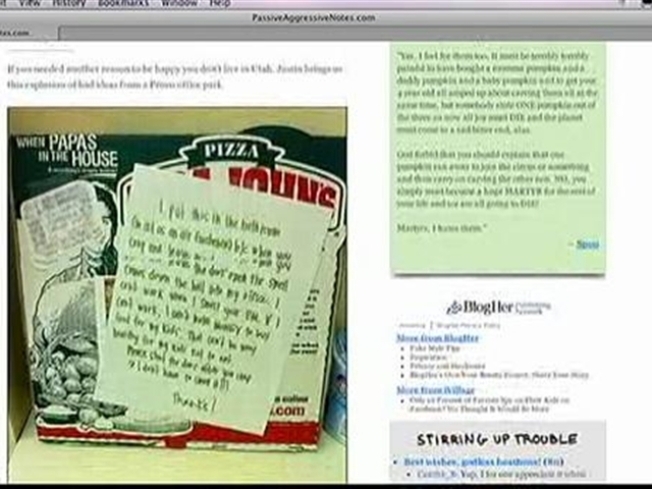 A new website, PassiveAggressiveNotes.com, has been showcasing some of the meanest, funniest, or just plain weirdest messages left to neighbors and co-workers around the world, many of which come from New Yorkers, who are no strangers to the occasional nasty message. The messages, which are usually posted anonymously, relay some of the frustrations that can come from living in New York and being in such close proximity to so many people. Kerry Miller, the creator of the website, said she got the inspiration for the website after living in a one-bathroom apartment in Park Slope with three roommates, who used post-it notes to vent their annoyances with each other. Miller’s favorite types of notes are the ones that get self-righteous, such as a letter from some Lower East Side parents who had plants stolen from their 4-year-old. Miller also loves the ones that are “trying to guilt-trip you,” she tells the New York Post. Have you ever left or received a nasty note? Let us know and share your experience with us on our Facebook page and your comments might be used on air.